First Sharifah Amani, and now Faizal Tahir gets banned? Hello? It's Faizal Tahir, not Janet Jackson. Isn't banning a rock star for baring his chest during a rock concert a bit too heavy-handed? Imagine forcing Red Hot Chilli Peppers to keep their shirts when they play. Or banning Man U players from taking off their shirts when they scored a goal. Go ahead Malaysia, keep banning local talents. At the rate this is going, there'll be nothing left to watch on local TV. Then everyone will switch to the Internet and your TV networks will suffer. Now here's a plug for a great online show that I reckon everyone should watch. 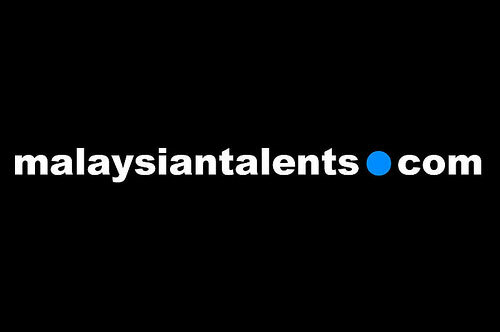 MalaysianTalents.com was originally a website of an online talent agency where actors, models, singers, etc post their profiles online so companies looking to hire their services can contact them. 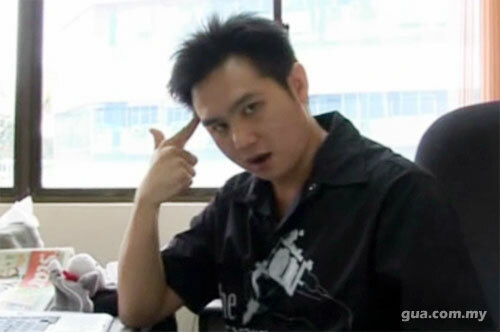 In MalaysianTalents.com "the show", Douglas Lim plays himself as the real-life eccentric head honcho of the agency who is so delusional he thinks he's better than everyone else. You may remember Douglas Lim from such Malaysian English sitcom as Kopitiam. The fun starts when well-known Malaysian personalities like Elaine Daly, Gavin Yap and Tony Eusoff dropped by his agency to submit their portfolios. That's when Douglas works his magic, exaggerating his own skillz , getting on people's nerves and giving advice to people who are clearly more experienced than he is. It's can be difficult to describe what the show is really about, but you really gotta watch the show to appreciate the humour. I got to preview the first three episodes of MalaysianTalents.com and already I'm hooked. No, the lady on the left was not having her period. That's just Davina Goh being Davina Goh. This is Gua.com.my's second exclusive online series after the successful launch of Kerana Karina last year, which received close to 834,000 views! Who would've thought Malaysians can be so receptive to online TV shows? In total there are 20 episodes for MalaysianTalents.com and each episode is only 4 minutes short, so it's bite-sized entertainment. The humour is subtle but the lines Douglas delivered as the sarcastic and obnoxious CEO are absolutely brilliant. I like the part where Elaine Daly told him she won Miss Malaysia and he replied "But beauty is not a talent now, IS IT?" What kept it interesting is that each episode they will get a different celeb to come in and "submit their portfolio". These are all people we're very familiar with in the local arts and entertainment circles, and some could even be friends of yours or mine. The best thing about MalaysianTalents.com is that it's unmistakenably "Malaysian", and that is why I enjoy it so much. 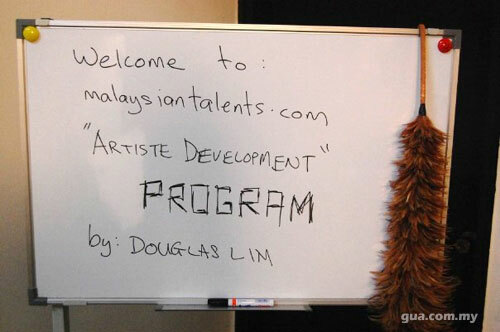 MalaysianTalents.com is now showing exclusively on Gua.com.my. New episodes will be posted every Tuesday and Thursday, and you can watch them online anytime you want for FREE. You could even watch it on a 3G phone. 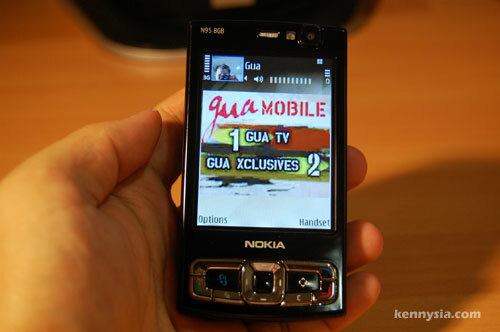 Just make a video call to *32223 for Gua Mobile, and the show will pop up on your phone like magic. For now, it's only available to Maxis customers for a cheap 30c per minute. Go on and check it out. 'Cos if you like what I like then you'll like it. 7:19 AM, 22 January 2008 | Link | Reply WOoW!!! douglas look a bit like u, heh! i don't actually get ur message on this post. however oh yeah it's about talents. the premise sounds like a mix of "the office" and "extras". douglas lim sure getting cuter....kenny,doncha think he looks a bit like you? i like ur blog. Keep it up. Kuching boleh!! Hey, Kenny, I don't actually get the messages from malaysiantalents.com. What's this website about? What's the purpose? If you din mention about it, I think that is you instead of Douglas Lim. One size smaller Kenny Sia. the idea of a david brent like character for a talent agency is great. but the show limits itself too much. where's the edge ? Wow.. Kenny, that guy could pass off as your twin. "I never knew shooting stray dogs is legal in Malaysia, but apparently it is so in Taiping. Their town council hired some guns to kill stray dogs and some poor guy kena shot instead. And people call me cruel for eating a snake." wat?? eating a snake is definately crueler than 'mis'shooting a human alrite....u may even kena tangkap 4 kena shoot....but u will b col a hero for kena caught wif ur pants down ! So how much did they have to pay you for the entry? Or are you getting a free trip somewhere? Talent show, another way to show your talent. i thought that first douglas lim pic was you! Yeah lor.I also think that Douglas guy look like you Kenny.lol~but of course he's hotter than you lah despite he's chubbier than you.LOL!!! some rule by the fa. malaysia talents dot com is so nice ! That guys is only.. 55 kg???!! that guy is only 55 kg?!! HALLO! WILL U BE ON THE SHOW??? HAVE A NICE DAY! What is this? "Just make a video call to *32223 for Gua Mobile, and the show will pop up on your phone like magic. For now, it's only available to Maxis customers for a cheap 30c per minute." Starting to feel you are a sellout to big business Kenny. Feels a bit cheapened by your blogs promoting big businesses to us.. At 30c a minute, that works out to RM18 per hour. Find it hard how you can justify that as "cheap". To me thats bloody expensive when considering 3G network UK is only another 5pound add on per month to go unlimited online. I watched all 3 episodes and it's entertaining and funny! johnng, well most of us don't live in the UK so how can we compare the rates in the UK and in Malaysia? Just to clarify. 30c a minute is the rate you pay to access Gua TV on the mobile. 30c a minute is not the rate for 3G calls. Each episode is only 4 minutes long, so 30c a minute to access Gua TV content is only about RM1.20, and I think RM1.20 is quite cheap considering Milo Ice at hawker centres now is at least RM1.90. hey peeps, don't u know? it can't be any cheaper cos telcos take like 60% of that. so what is a content provider to do when there's demand? they have to just go along with it. i can tell you that malaysian content providers barely scrape by. the beef should be directed at the telcos. but RM1.20 per ep for something new like this is ok. support the industry. the actors, scriptwriters, cameramen all need to get paid also... plus, please don't make stupid comparisons with other countries. especially a country where a kebab and coke would cost RM30! The ban on Faizal is perfectly "justified". Since it takes Janet's boop to get that kind of reaction in the US, Faizal's chest would be an equivalent here in Msia. We're not as liberal as the Americans and will never be anytime soon. Just live with it. We should all be thankful that they don't make prayers compulsory on Astro. I think its perfectly reasonable to expect local prices for local content. Its not like those guys are paid in pound sterling or the entire production cost is shot and paid for in US doallars. You wanna watch US shows, yeah price it at US prices, Msian shows = Msian prices?? Too much to expect? My main grouse is that Kenny's blog seems to be more commercialized these days and if he's not careful he'll lose the edginess of this alternative form of entertainment. If it gets more commercialized, might as well turn on the TV instead..
Also seems quite reassuring to find Msians still as rude as ever..
johnng, exactly. RM1.20 for 4-min content IS malaysian price. out of that, the content provider probably gets 20 SEN. that's perfectly reasonable don't u think? imagine if a full episode is charged 50sen. that leaves the content provider with like 5-7 sen. where's the incentive for people to produce content? it's already free to access online. RM1.20 to watch a 4 minute long video on your mobile phone IS Malaysian Price. Paying RM0.00 to watch MalaysianTalents.com online for free is also Malaysian Price. Reading kennysia.com without paying a single cent is also Malaysian price. If you think paying RM1.20 an episode to watch this excellent Made-In-Malaysia drama series is expensive, then I seriously wonder what price you think is reasonable. If you want something free and uncommercialised, go online and watch MalaysianTalents.com for free. There's not even a single ad in that series. If you want to read a free but commercialised blog online, read kennysia.com. Because I've been putting so much time and effort on my blog, I think rewarding myself every now and then is perfectly reasonable. Especially since I'm not asking any money from you. Jez - the incentive lies in producing a superior content. Jus as US tv shows though are essentially the same story lines most of the time rehashed over and over again, a noticeable difference is the superior quality of script writing and production values hence Msian entertainment are willing to pay the higher prices demanded by them rather than pay the same amount for the local production houses. kennysia - I detect that you're seem a bit upset. Don't. I'm just voicing out an opinion thats all. I think when you use the tone "appears like magic" seems a bit too pandering to your audience of fairly well-educated English middle-class Msians jus as asking me to believe that 30c a min is a "cheap" price. jez - sorry to be long-winded. But yes, jus want to point out that at 5-7cents is still worth it, cos if the show is as hot as you all claim it to be, your viewership will expand hence more revenue is reaped (5cents times X number of viewers). But remember it only makes money if a lot of ppl think its a really "good" show! Hence the incentive to provide a superior product than these US shows! *Sigh* why ah?? why ppl like to pick on others over small thing like this? The whole show is a copycat idea la. U expect duggy Lim to produce something good? Gv me a break! He can act ah? Gv me a break! 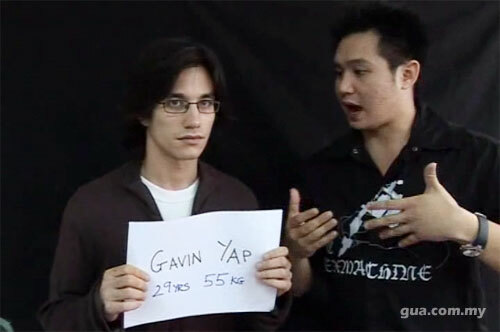 Gavin Yap is cute~ lol. i like some of the articles he wrote in the newspaper.. ahya. but i forgot wat newspaper liao la.. NST or weekend mail.. ?? hmm.. I knew Douglas Lim from when he was starting out as a backup singer and he's definitely got 'creativity' in his blood. The script was good but as usual, Douglas is funny. He's not really like that, in real life. Kenny have nice post for readers to read and cheers to him. thanks loads for the mention kenny!